Drypoint, 1897 ; a fine impression of this rare print on laid paper. Inscribed in pencil at the lower left margin Helleu. With large margins, in very good condition. To the platemark 278 x 98 mm, the entire sheet measuring 468 x 497 mm. A painter and an engraver Helleu was a master interpreter of feminine elegance and grace at the turn of the century. He studied art at the Ecole Nationale des Beaux-Arts in Paris under Gerome and became friends with some of the leading artists of the day, including Tissot, Whistler, Monet, Sargent, Rodin. 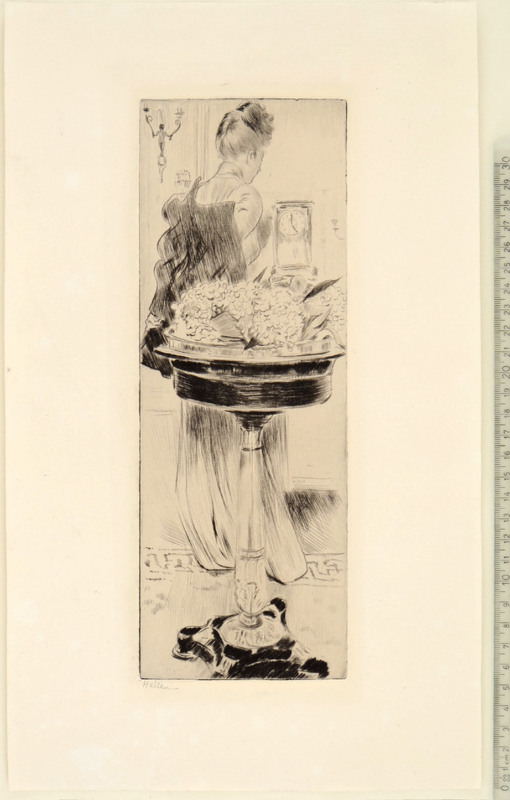 By 1885, Helleu had produced his first drypoint engravings and lithographs. His worldly effigies, female silhouettes, and sportive scenes of the elegant class, are among the most precise images of the belle époque.